StormWall Review 2019: Is StormWall a Good Hosting? StormWall offers a variety of VPS hosting plans, but these are lacking in many features compared to other plans. They’re also overpriced for the features offered. onClick="trackClickout('event', 'clickout', 'Vendor Page - Visit User Reviews', 'StormWall', this, true);"
Let’s start with their website. There I found almost all the information about work, payment, services provision. The support has already told how their protection against DDoS works and they also helped me to choose a tariff. Admin panel is simple and clear, I’m satisfied with their services and I’m looking forward to further cooperation. Stormwall has a higher than average price in the market, but the admin panel seems a little better than the others (I tried both American cloud and other analogues). As a result, I remained on Stormwall and absolutely satisfied so far. StormWall is a privately-held Slovakian company offering a variety of internet and hosting services. They specialize in VPS and dedicated server hosting, but they also have premium SSD shared hosting with automatic DDoS protection for extremely security-conscious individuals willing to pay extra for the coverage. Their VPS packages, unfortunately, are average at best and provide fewer features than you’d see on standard providers. I like the unlimited traffic, DDoS protection, and bandwidth speeds, but I’m not a fan of some of the other available features such as the amount of RAM and storage. Servers at this level should offer higher features, especially considering you’ll pay considerably more for this than shared hosting. Regarding usability, this is not an option for beginners as you’ll need to be able to set up and maintain your own server. You can have the OS pre-installed for you, but beyond that, you need to know what you’re doing. Other value-added features available for purchase include a CDN, cloud web application firewall, website proxying, and TCP/UDP IP protection. This is in line with StormWall’s company name and mission to give their users the best possible protection against hacking and DDoS attacks. These plans allow you to customize the amount of bandwidth, operating system, management panels, and the number of WebSocket ports for an additional fee. Regarding pricing, these VPS setups are a bit pricier than the industry average. Also, I’d like to see more customizable options for these plans. 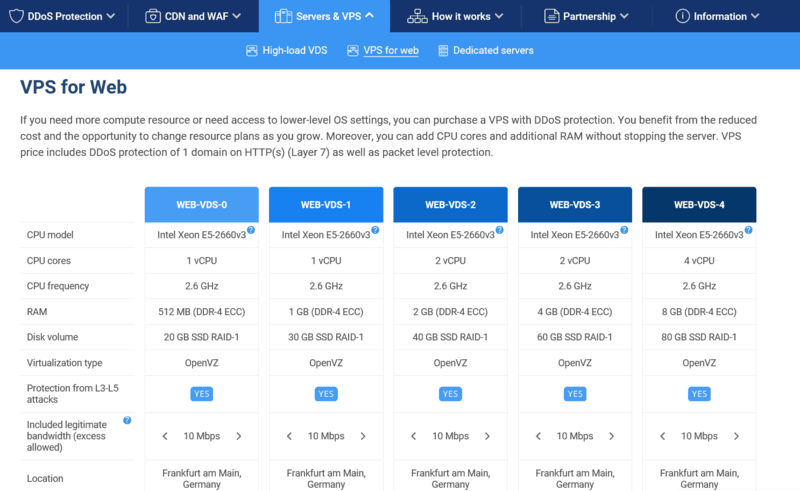 Many VPS hosts will allow you to customize multiple features such as storage and RAM or even offer a fully customizable option. Some providers will provide more in terms of storage and RAM for a lot less. The same goes for their SSD shared hosting plans. The main value-add of these plans are the extra security features, but quite frankly, I don’t see them providing that much more utility above and beyond their competition — definitely not enough to justify their high prices for shared hosting. All in all, even if you’re security-conscious, there are far better options elsewhere for a lower price point. Regarding support, there don’t appear to be many options. They do list contact phone numbers, but their email and live chat are for sales only. They don’t offer a support section or a knowledge base on their website. I tried contacting them via live chat, but other than them saying they would provide help, they wouldn’t give me any actual information on how to contact support. Granted, if you’re using VPS, you should already know how to do most basic admin tasks. However, a clearer statement regarding what support they do offer is sorely needed. StormWall’s VPS packages offer “average at best” features compared to other providers. Other providers offer a lot more for the same price as you’d pay here. Honestly, you’d be better off using shared website hosting versus overpaying for this service. Wondering how StormWall stacks up against other Web Hosting companies? Enter any other Web Hosting company and we will give you a side-by-side comparison.